Last week, just days before coordinated terrorist attacks in Paris on Friday November 13th left 129 people dead, inflammatory posters linking Students for Justice in Palestine (SJP) and the Muslim Students Association (MSA) to terrorism and anti-Semitism appeared on several college campuses in California and in Washington, DC. Another poster smeared the boycott, divestment and sanctions (BDS) movement for Palestinian rights as anti-Semitic. The posters were discovered Sunday evening Nov. 8th on the campus of American University in Washington, and reported by Elli Bloomberg in The Eagle, the AU student newspaper. Similar posters were found on Thursday the 12th on the campus of UCLA and reported in the Daily Bruin. The anti-BDS poster showed a bloody knife being thrust into the center of the Star of David under the text, “The real meaning of BDS: Boycott, Divest, Stab,” and bore the same hashtags described above. The 4th poster specifically targeted the MSA, by showing a crosshairs over the American al-Qaeda member Anwar al-Awlaki assassinated in Yemen by a drone strike. The text on the poster reads, “MSA Terrorist: Head of al-Qaeda in Yemen, President MSA Colorado State”. The New York Times reported in 2011 that al-Awlaki was the president of the MSA chapter at Colorado State where he studied engineering. The appearance of these incendiary anti-Muslim and anti-Palestinian posters on college campuses comes in the context of increasing efforts to suppress free speech advocating for Palestinian human rights and the growth of campus BDS activism by a broad network of pro-Israel organizations, including not only the David Horowitz Freedom Center, but also StandWithUs, the American Israel Public Affairs Committee, the Jewish Federations of North America, the Jewish Council for Public Affairs, the American Jewish Committee, the Committee for Accuracy in Middle East Reporting in America (CAMERA), Divestment Watch, the Israel on Campus Coalition, Campus Watch, and the David Project. Republican Party-supporting billionaire donors such as the Koch brothers and Sheldon Adelson are generously funding such anti-BDS and anti-Palestinian human rights initiatives. Inflammatory anti-SJP posters promoted by David Horowitz and the Freedom Center were previously distributed on the UCLA campus in February and in April of this year. are any university administrations denouncing these posters? Are there not legal steps that can be taken to stop these libels and harassment by Horowitz and his ilk? After I am admitted to appropriate BAR associations, I intend to donate services to fight Zionism (Jewish Nazism). As for this question, first an attorney would have to determine whether SJP qualified to sue for libel in the chosen jurisdiction. Such qualification would be challenged early in the case. The bad guys would also file an anti-SLAPP motion to dismiss and from there it would be an uphill battle. There might be better way to get the Universities to move against Horowitz and friends. At Columbia I suspect that The Institute For Israel And Jewish Studies puts Columbia in violation of state and federal anti-discrimination laws and might jeopardize Columbia’s tax exempt status. There are a lot of these Israel programs at US universities. Using legal attacks on such racist programs to get leverage to force universities to act against Horowitz and friends might be a good way to deal with the libel. i’m sure palestine legal http://palestinelegal.org/ is aware of these posters. if this horowitz group was a student/campus affiliate the school could be legally accountable if they made no effort to ban the group and punish them for such action. but i think horowitz works thru the student groups and they don’t place these posters in the light of day w/people watching, it’s a covert action. albeit, not so covert horowitz doesn’t admit to it, but you won’t see students admitting to placing them and for sure there are students who work in this capacity to facilitate these posters on their campus. They are such scumbags, they will try anything to stop the BDS movement, and now they have stooped down to such a low level. This is really ugly, but it means the BDS movement is hurting them. Imagine the whining and accusations of anti-semitism, had similar posters been put up, stating that Israel is a brutal occupier, and keeps stealing lands to build illegal settlements (which in this case would be the truth). In fact someone should do so. There is so much material to work with, and it is documented truth. I think the Muslims students and BDS members should protest this loudly, and have strong objections to these hate posters. BDS is working, and hopefully it will grow. This is the only way to deal an occupier. Excellent idea. I would like to see almost IDENTICAL posters put up, but with the roles reversed. The slogan would be “Stop Zionism”. How could the Zionists complain now? The phrase “Regardless of how they depict themselves” is especially applicable to the Zionists. Such a response would logically be followed by formal debates on the relative accuracy of the two sets of posters. Such debates would destroy the Zionist myths on campus. I’d be inclined to wage the war against wrong ideas with better ideas whenever possible. That’s the purpose of the 1st Amendment. It seems to me this is an opportunity for some information judo. As Sun Tzu explained in “The Art of War”, information is one of war’s most powerful weapons. just a reminder : m.blmerthal has already got students to use the label : JSIL to refer to Israel. So take heart. From the start Zionists realized they had to build an “Iron Wall” against their own wrong ideas. “Every indigenous people will resist alien settlers …” so “we must either suspend our settlement efforts or continue them without paying attention to the mood of the natives…[and thus establish] in Palestine …a force that will in no way be influenced by Arab pressure.” Jabotinsky. This is part of what happens when the Iron Wall of the military can’t protect the wrong ideas of Zionism. There will be much more material to work with. After all, Israel is a so called democracy, that sponges off American tax payers, so some facts might set the record straight. There is a long laundry list of crimes against humanity, graphs and photographs throughout the years. Time the American public knew exactly who the real victim is, and it ain’t the Israelis. Just to make sure. If you’re calling 4 year old children essential “Haters,” and essentially depicting “Who [Palestine-supporters] Really Are” as babies toting automatic weapons, then what you are really doing is the exact same thing as what Ayelet Shaked did in calling for the annihilation of the children, pregnant women, and the unborn, as a preemptive act, right? Right – isn’t there a defamation lawsuit in here somewhere. Reverse the situation and put Hillel or some other Jewish group in these posters. So far beyond the pale. If the following organizations don’t speak out about this and disassociate themselves from any interaction with horowitz then each and every one of their members needs to be named and shamed. Constantly. The Daily Bruin (UCLA) published a letter from David Horowitz “Posters linking SJP, MSA to terrorist groups are not Islamophobic“. The Daily Bruin allows comments to be posted online. Horwitz demonstrates just how uneducated he is. Why would pro BDS, folks go to the bother of boycotting and divesting before stabbing Israel.It would be far easier to move to part three first. Work smarter , not harder. Horowitz is a moron who is fighting a losing battle and he knows it , hence his desperate reactions. @ “Work smarter , not harder.” Well, that would depend on what your aim is. Since Palestinian culture is “a culture that Teaches Children to Slaughter &c.”, it seems the aim is not BDS, but just to kill Palestinians, including the mothers, before they breed those little ‘terrorists’/’vipers’ that you see in the picture. But it does mention “jihad” and I suppose no-one would ever link jihad to Islam. Exactly! How often do mw zionist commenters wail about BDS seeking the destruction of Israel? And how often does the BDS statement declare its hatred or even antipathy to Jews? yesterday (Nov 19) brand new facebook page “Boycott from Within” was born and is soliciting likes from far and wide – so folks who can, please do! Can the campus based Jewish organizations be linked to Iraq war,Iran sanction and assassination,Gaza wars and general atmosphere of Islamophobia in media? Can any poster appear on Congreess and State Assemblies linking Jewish money to Iraq war,Gaza war,Iran sanctions and Syrian wars? It won’t appear but if it does the department of antisemitism with ADL and JINSA and AIPAC would pour more money on Jewish organization,remove the students,and cry hate crime charges against the cartoon picture poster . The temptation is strong to find a way to ban the posters or discipline their promoters, with lawsuits, etc. This would be a tactical mistake. Whatever rationale that succeeded against the posters could be turned against pro-Palestinian groups, think of claims that Jewish students feel “threatened” by criticism of Israel (speech is a threat) or the CA legislature’s attempt to list criticism of Israel as an anti-Semitic act (speech could lead to another Holocaust). The anti-BDS crowd wants nothing more than to censor criticism of Israel. Freedom of speech is the strongest weapon of the BDS movement. The best offence against lying speech is never to shut it down and always to create more and better speech. Totally agree, John. These are only cartoons (with very silly captions). Jews (and non-Jews) value a sense of humour above commitment to Israel. Horowitz may appear to a very nasty piece of work, like the cartoons he has generated, but anyone who has heard him speak will realise what an opinionated, dishonest, unprincipled, ignorant and hysterical buffoon he actually is, apparently determined to make his cause a laughing stock by demonstrating the paucity of his objections to BDS. Those activist scumbags have to be reminded that no person, people, or group can force any of us to buy products we don’t want to buy, support businesses, cultural groups, or institutions we don’t want to support, or invest our money in a manner NOT of our choosing. They don’t have that power. I wonder what Woody would think about Arlo getting bar mitzvah lessons from Meir Kahane. being that Kahanes public image was a grotesque exaggeration of what the man was trying to accomplish “Woody” might have thought it was none of his business. Kahane did not advocate for violence against peaceful Palestinians. He was the epitome of the ultra-national Zionist, true, He would have offered Muslim Palestinians much the same thing they offer Jews in almost ALL Muslim states: protection and prosperity but not nationality. Or they could move with monetary compensation . His most controversial idea-and one which he paid with his life for in a violent crime was not for advocating violence but for advocating for forced removal for those Palestinians who refused either citizenship with full rights except nationality (as if Jews were ever offered Arab ‘nationality’. -or- financial compensation. That the idea of ‘forced removal’ was abhorrent to many Israelis as it was to a lot of the world was amplified in the media and the media made the man into a giant-but for many-a giant monster. Considering there has been almost no movement since Oslo and considering the position held by -i’m assuming-most Palestinians Kahane’s ideas were no more ludicrous then are the ideas from the left that Israeli Jews turn over sovereignty to a Muslim majority (though-often Israel-haters refuse to admit this) and either leave with some compensation or submit to dhimmitude which is simply how Islamic society and culture is brought up to look at Christians and Jews in their midst wherever there is an “Islamic’ nation such as Iran, Yemen, and some North African communities. In fact-there are many testimonials from Christian Palestinians documenting the ways that the dominant Islamic society/ culture extracts ‘payments’ for protection and permission to do business. *B.Dylan also took lessons from Kahane. So- make sure to bds Dylan and Alice’s Restaurant. MY REPLY: Yes, it looks to me like the fascists have won. But then, I’m a chronic pessimist. MY REPLY: By all means! ! ! * We finally agree on something. Cool Booker White. Is that a Hound Dog resonator he’s playing? REPLY: It looks like it to me. 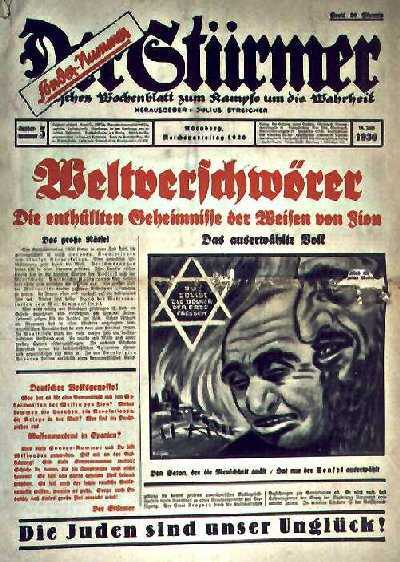 It doesn’t seem that Zionist propaganda has changed since the forties. I’m pretty sure they got that bloody knife pic from WWII. Worked then. Why not now? I wonder what happened (LOL wink, wink). I suppose I should be flattered. 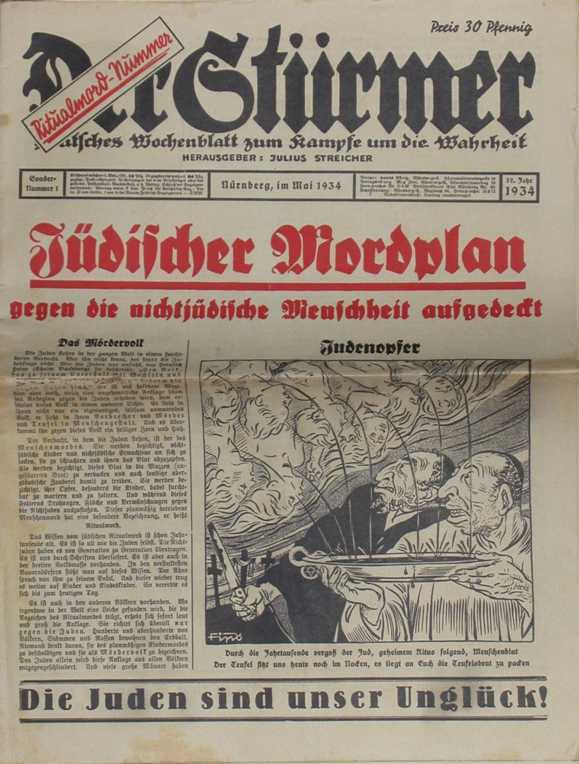 I linked to a different (even more anti-Semitic) copy of Der Stürmer below. Let’s see if “they” can block it as well. Dickinson!!! I’m finally getting to like the sound of that. Actually, I’m really a Dickinson! Well, sort of. 1. RICHARD DICKINSON was born 1564 in London, England. 4. WILLIAM DICKENSON (GRIFFITH3 DICKINSON, JOHN2, RICHARD1) was born 1652 in Charles City Co. Virginia, and died 1734 in King William Co..
7. ROBERT DICKERSON (GRIFFITH6 DICKENSON, NATHANIEL5, WILLIAM4, GRIFFITH3 DICKINSON, JOHN2, RICHARD1) was born 1737 in Hanover County Va, and died 1819 in Louisa Co. Va.
M Y COMMENT: David Horowitz has truly done Julius Streicher and Der Stürmer proud! ! ! P.S. David Horowitz has truly done Julius Streicher and Der Stürmer proud! The people who put up these posters include some of those oh-so-sensitive Special Snowflakes who will whine about ”not feeling comfortable” when anyone dares to criticise Israel on campus. I’ve witnessed many a divestment discussion and vote, and the majority of the anti boycott crowd were Jewish Americans talking about how it made them feel unsafe. Literally the majority of them didn’t bring up actual points, just that it made them feel unsafe, or was about their feelings one way or another. Yeah, they know they have no objective case against the BDS supporters, so they make it all about themslves and their precious ‘feelings’ – which naturally is a way of hinting, if not outright stating, that BDS=anti-semitism. Maybe these kids should grow up and realise that nobody is entitled to glide through life without having their views challenged. No, not even pampered Zionists. People who smugly make excuses for rabid “diaspora” Jews ranting about “Palestinian animals” or justifying the burning to death of Palestinian babies are the quickest to start screaming sbout how they’re “under attack” or “don’t feel safe” whenever anyone brings up anything pro-Palestinian, not least of all the widespread Jewish apathy, complacency, or support for the state of Israel against the Palestinians and often also the “settlers”. I really don’t give a damn if these astounding, unbelievable hypocrites “don’t feel safe” when it comes down to it. Run them off campus, for all I care. I’ll be on the sidelines, applauding. The Zionist myth, in key ways, is EXACTLY like the myth constructed by Southern whites to justify their slave society. Everything is whitewashed, their social structure is paradise, the whites are good and noble, and the slaves are thankful for their jobs. And the Bible supports them. After losing the Civil War they doubled down on their myth, in which the loss of their paradise was a great injustice. The Zionists today are milking the most virulent remnants of that racism to get U.S. support. This type of myth-making is not unique to these two situations. It is a more general phenomenon, with ethnic supremacism at its base. The Southerners’ tenacious holding on to their myth after losing the Civil War shows the degree such myths can be entrenched. It suggests the Zionists are not going to give up their myth and their sense of entitlement easily. They will have to be forced. But reader comments at major news sites show the Zionists have lost their capacity to keep the facts from the American public. Those facts are becoming more widely known, and the pace is picking up. The Zionist myth will become untenable. Hopefully international sanctions can avoid the need for military force. The thing with racism is that it is stupid and superficial. So much that I want to puke. “Jihadists. Jew haters. Antisemites. Terrorists”. I would like to find one meaningful, smart argument in Zionist propaganda. But those people don’t even make that effort. You go to the review section of a book that is critical of Israel, and all the one-star reviews say the same thing: “Lies, lies, lies.” Tell me something smarter. Tell me why they are lies. Tell me what SJP really is about and why you oppose it. If BDS continue to make their posters smart, accurate, instructive, and respectful of the readers’ intelligence, then people would start seeing the difference between truth and propaganda. Isn’t this reverse “blood libel?” It is. So is unconstrained, generalized, vicious caricaturing now acceptable behavior? It appears so. Let the games begin. “Satire” the hell out of whoever is putting these posters up. PS. I know it’s wrong whoever does it and for whatever reason but a moralizing “tsk tsk” doesn’t cut it anymore. People are getting killed because of this crap. The only way to make it stop is to make it hurt. Sad. No matter how hard ADL, Freedom Center, Aipac, Jinsa try to put apartheid Israel back in the bottle just not going to happen. Hey, folks. Boycotting is money and shopping. Terrorism involves shedding blood. Gandhi, among others, supported boycotts. We need to see more of Gandhi’s images on BDS announcements. If anything would embarrass Horriblewits, this would. How did ya figure out that “we” “need to see”? What made you think the point would be to “embarrass” anyone? Are Zionists even capable of being “embarrassed”? Are Gandhi’s images somehow supposed to “embarrass” Zionists who have no shame in depicting Palestinian rights supporters as being programmed from childhood to “shed blood “? And, by deploying “Ghandi” are you tryin to reinforce some idea? It would certainly be hard for the Zionists to claim Gandhi for their side. Pretty much impossible. As per usual, all these whiny wastes of space can fall back on is “wah wah you just hate the Jews”. And they’ll be sure to say “for no reason” as well. Absolutely disgusting. These people are hypocrites in everything they do, especially when it comes to accusing other people of “bigotry” whilst tolerating ridiculous, evil bigotry directed at Palestinians, Arabs in general, Iranians, “the Muslims” and indeed just non-Jewish Middle Easterners as a collective.